sort the grid on clicking a header column. 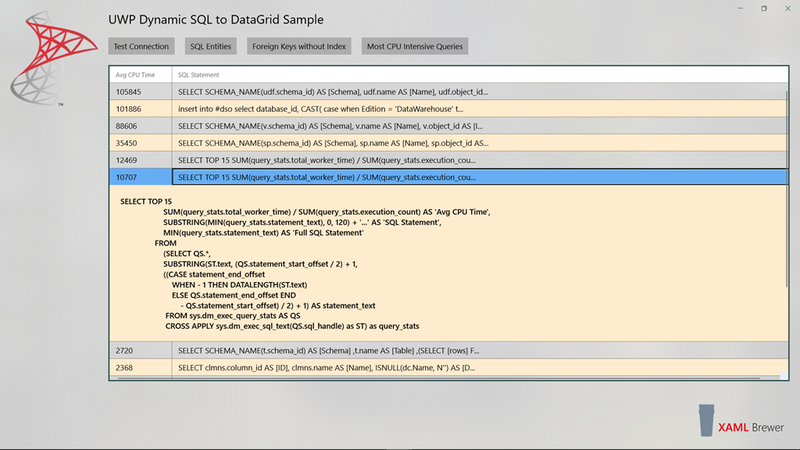 This type of dynamic data binding and visualization is particularly useful in the parts of an app that deal with administration, diagnostics, monitoring, or trouble shooting – where you don’t necessarily know upfront which queries to launch and don’t have the possibility (or resources, or priority) to define a full entity model and/or specialized UI controls. 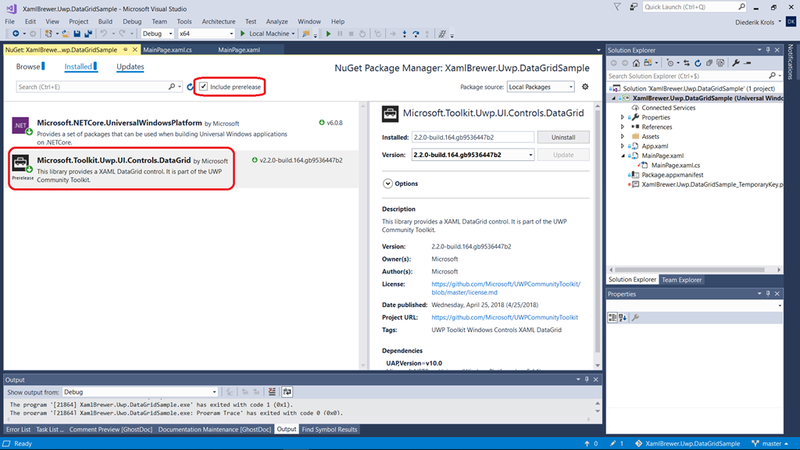 The DataGrid XAML Control is a port from the popular Silverlight control with the same name. Most -but not all- of the functionality has been migrated. This article does NOT focus on its full feature set, but only on dynamic data binding. Please check the official documentation and the source code of a complete sample app for more info. Its documentation is not yet fully uploaded, so some of the hyperlinks in this article will point to the (2011!) Silverlight version. So let’s create some tabular data. The Silverlight -and hence UWP- version of the control doesn’t allow this, so there’s a tiny bit more programming required. If you would want to rename columns here, or skip some, or add some new ones, then this would be the place to do these changes. In the sample app, we manipulated the content of one of the columns. Some of the queries contain the text of a TSQL query, a long string that may contain visual formatting with tabs, carriage returns and series of blanks. That’s good to display in the details template – which is what we do. For a regular column it makes more sense to truncate the content, and get rid of the carriage returns. The call to AcceptChanges() is not strictly necessary but we do it to save memory. The call locally commits the changes inside the DataTable and clears the –potentially bloated- row versioning information. The sample app lives here on GitHub. When playing with it, don’t forget to bring your own connection string to MainPage.xaml.cs. 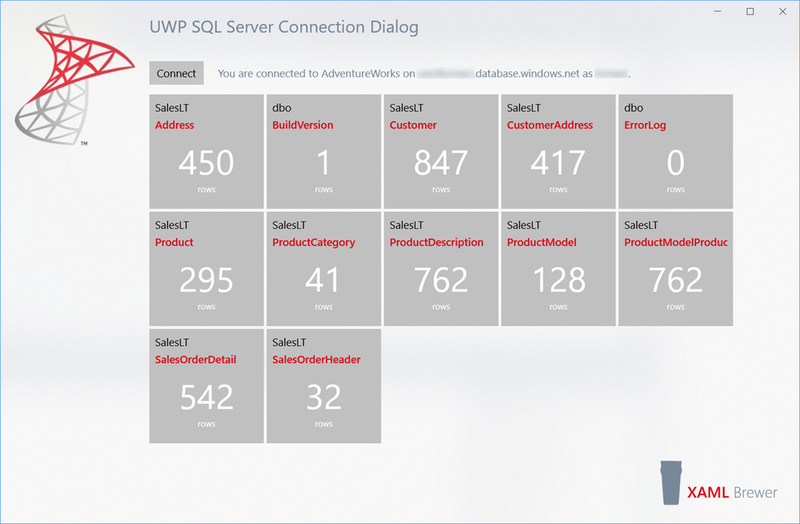 This entry was posted in SQL Server, UWP, UWP Community Toolkit on May 29, 2018 by xamlbrewer. You can type a server name or select a recently use one. You can select the security mode. 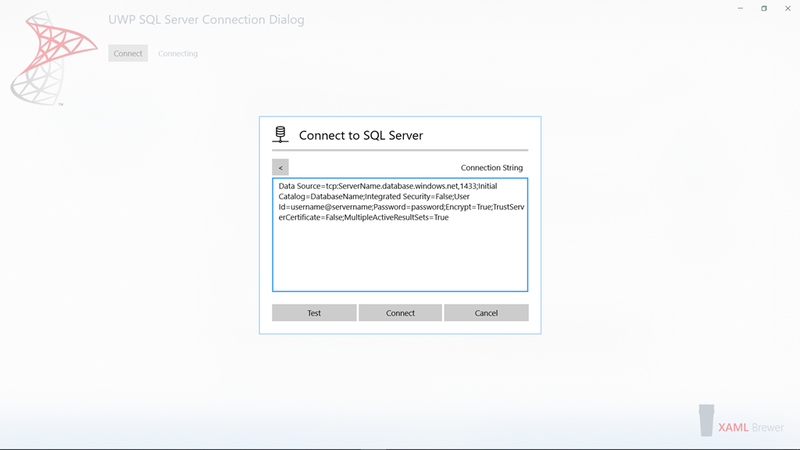 You can enter your credentials when SQL Authentication is used. You can select the database from a list. You have direct access to the connection string. 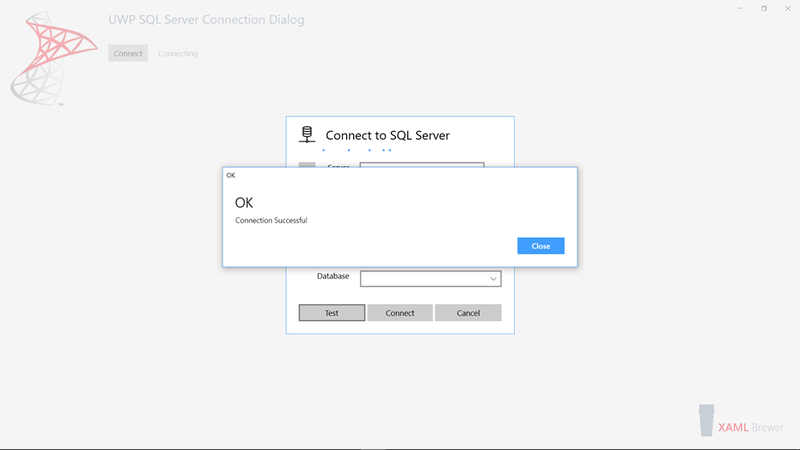 When the dialog closes, it will serve you with a validated connection string (unless you cancelled the operation). 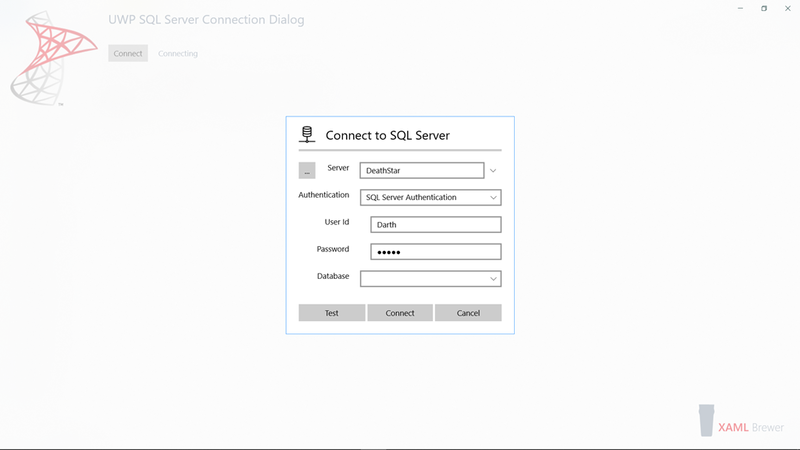 The SQL Connection Dialog is based on a ContentDialog. Under the title (which has a nice SVG Icon – thanks to TheNounProject) there’s a ProgressBar from which we toggle the IsIndeterminate property to indicate whether the control is busy – i.e. establishing a connection or fetching the database names. The first row in the input form is a custom editable combobox for the server name. Then come some regular input controls –ComboBox, TextBox, PasswordBox– for the security parameters. At the bottom of the input zone there’s a ComboBox that hosts the names of the databases. All text fields on the input form have their IsSpellCheckEnabled set to false – we assume you don’t want red squigglies under server names or user accounts. /// Gets or sets the SQL user identifier. The ellipsis button in the top left corner sets the control in direct input mode, showing a large multi-row textbox to manipulate the connection string. A ContentDialog can have maximum three buttons at the bottom, and we’re using all of these. The PrimaryButton allows to test the current connectionstring, the SecondaryButton returns a validated connectstring to the caller and closes the dialog, and the CloseButton … well … closes. A few classes from .NET SQL Server ecosystem were not ported to .net core. 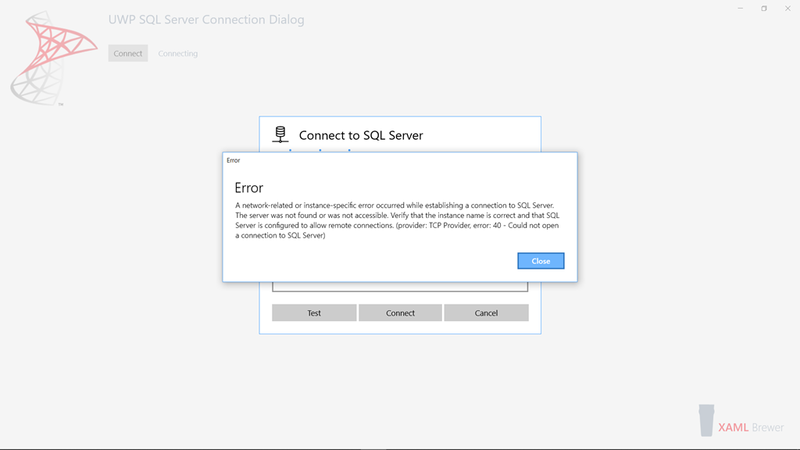 One of these is SqlDataSourceEnumerator, which allows to lookup SQL Server instances on the local network. So we can’t do this on UWP. Of course there’s similar code the other way around. It keeps the dialog the same size, and it freezes the mode switch button at its position, making it easy to rapidly check the connection string and come back. We’re updating the UI during the call (remember there’s a ProgressBar), so it’s a good idea to use OpenAsync here. The Using statement will make sure that we close the connection automatically. Again, we used the asynchronous versions of the operations (ExecureReaderAsync and ReadAsync) to keep the UI responsive. 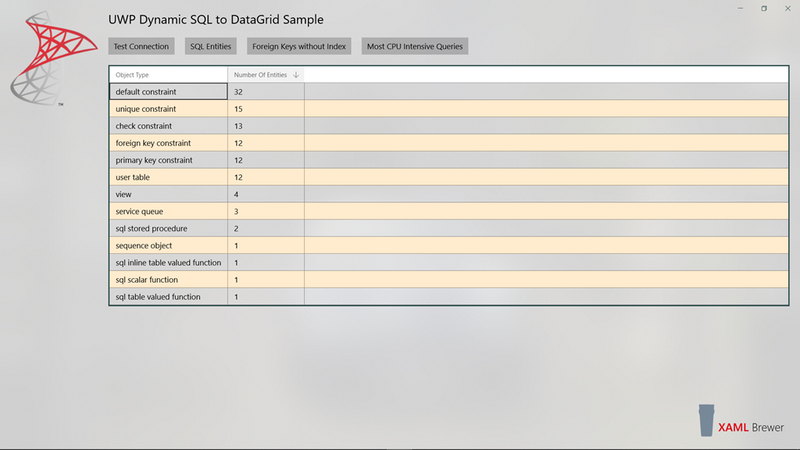 The sample app with the SqlConnectionDialog lives here on GitHub. 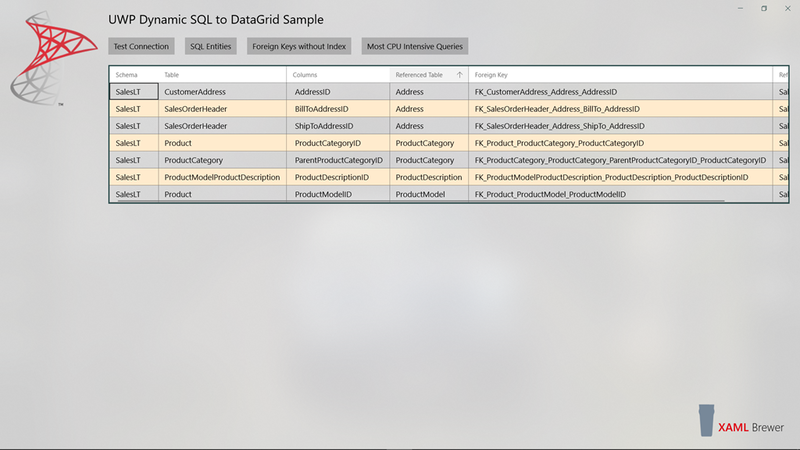 This entry was posted in SQL Server, UWP on May 14, 2018 by xamlbrewer.